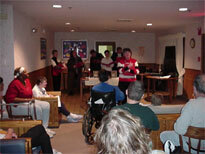 Father Andrew held a small service at the Garden Center, and the choir sang Christmas songs. 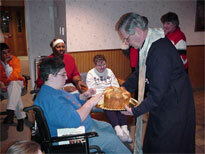 Afterwards, Father Andrew blesses a loaf of St. Basil's bread for the New Year and distributed it the residents. One of the residents recieved the golden coin hidden in the bread signifying prosperity in the coming year.